Today we’re happy to host Peter Cannon in our “Meet the Creators” section. 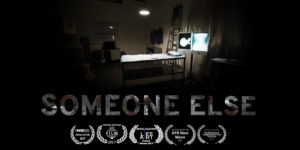 Peter is the creator, writer and director of “Someone Else“, a haunting sci-fi thriller in which the viewer is immersed in the horror story as if it’s happening to them. The film was released on Inception as part of our Friday the 13th scary VR weekend and is a major hit with our audience. 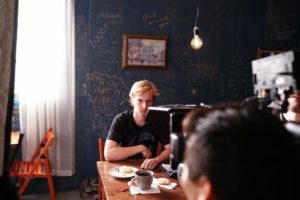 The film has also won rave reviews, was featured in several international film festivals and was also an official selection of the NYC Independent film festival. Hi! I’m Peter, I’m from Connecticut. I’ve wanted to make weird sci-fi and fantasy ever since I saw the Matrix when I was 12. Before that, I wanted to be a paleontologist so it was actually a step up in terms of realistic career choices. My first real exposure to film was when I went to Emerson College, where I was the stereotypical film school production kid. My freshman year, I assumed being a 1st Assistant Director was a stepping stone to directing – it had ‘director’ in the name, it had to be a good choice of position, right? So I did that on set for entirely too long. I was writing and directing as much as I could at Emerson (I’m personally proud of my BFA Thesis), but it seemed like I was married to the production department. That’s all I did for work the first couple years after college until I was approached by my producer Christina Tontisakis to do a 360 film. Nowadays I’m directing commercials, shopping around my urban fantasy series, and writing a feature. Q: What’s the story behind “Someone Else” and what was your vision when creating it? In the story, you’re this character whose body has physically degraded to the point that you can’t move. You’re not sure what’s going on, you’re slipping in and out of consciousness, but you DO know that you’ve been held in a private island research facility as a lab rat for… something. One of the lab employees, out of sheer guilt, contacts your sister – and they start the arduous process of wheeling you off the island. Everything that follows is viewed from this character’s perspective. Q: Why VR? Did you always know you wanted to create a VR film, or did it just seem like the right medium for this piece? 360 video was a bizarre opportunity. In late 2015, Christina told me that she had access to a 10-camera 360 GoPro rig – and until that moment I’d never even considered making anything 360. Where do we put the camera in the scene? Do we acknowledge this thing that’s in the center of all the action, or pretend it’s not there? There’s no wrong answer, really – or at least, there isn’t a right answer that has been established yet. So for this movie I wrote in a ‘character’ that served as an audience vessel in addition to having plot significance. My DP Steven Carson told me at the beginning of all this: “If you’re making something in a certain medium, that medium needs to be the only way this story can be told. Otherwise, why couldn’t it be a short film? Or even a comic book?” With Steve’s help, I wrote the script with that in mind. Without giving too much away, the fact that this is a first-person perspective is very important to the story. Q: How was the film received by the NYC Independent film festival audience? Can you tell us about how you presented it there, and how viewers reacted to the piece? As it is with screening any VR or 360 project, not only are festivals not 100% used to screening it, but people aren’t totally sure what to expect yet. Most of them walked in just having heard there was a “VR” section – so the lines built up fairly quickly for the 4 or so GearVR rigs they were screening the films on. Again, since this is so new, there were some unforeseen snags up front like the GearVRs overheating, or losing battery. But once it got going, it was fun to hear people talk to each other about the film without knowing I was the writer/director! The people who I talked to about it had loads of questions, especially the people who really liked it, and it was a cathartic experience talking about the whole thing. Their favorite parts were the moments where ‘you’ were touched directly by the characters. I saw some shivers and jumps while they were plugged in. I’ve got another one lined up and ready to go – pending funding of course! For this next one, I want to take a crack at true sci-fi horror (rather than flirting with that line in Someone Else), taking the technology a step further with ‘gaze-based’ input (which means the direction you look triggers certain clips). This interactivity puts it in a ‘true’ VR category rather than straight 360 video. I’m picturing more jump-inducing moments because they’re like traps that spring when the audience sets them off. It’s gonna be awesome. Be very wary of ‘stitch lines’, the lines in which one camera’s frame ends and another begins. Some cameras today have as little as one stitch line (for a two camera rig), but the higher the resolution picture, the more cameras you’ll need, and the more stitch lines you’ll have. Because of how wide the lenses are on whatever 360 rig you’re using, chances are they’ll be designed to fit with each other outside a certain radius for a better background picture. The trade-off for that can be a nightmare: a character that appears over two seams will look like they’re chopped in half. You don’t think it’ll be a big deal in post, but it will be. Secondly, editing doesn’t work the same way. Again, the rules haven’t been established, but I’ve found that the only way you’re going to get a ‘close-up’ is if characters are physically close to the camera (however you want to accomplish that). Not only should you re-read my first point, but also keep in mind that cutting closer to them means resetting the entire picture to be closer. That can be super jarring if you don’t guide their eyeline properly and provide enough new content for them to look at in the next shot. Thirdly, there’s no need to pan or tilt the camera. The audience should look around on their own – it’s the medium where they “get” to. Instead, give them a good reason to look up, down, and around. Also, your audience will get some serious motion sickness if you mess around with pans and tilts. I suffered through a handheld 360 film once that did that. I couldn’t finish it – it made me too nauseous. Finally, be wary of your runtime. Traditional film and TV allows your audience to look away and not be punished – VR and 360 doesn’t let them have this, and there’s a real limit to how long your audience is going to want to wear the rig. In my next project, I’m definitely going to err on the shorter side.